Port of Savannah container volumes jumped 25.8 percent in April, with a total volume of 335,337 twenty-foot equivalent container units, or an additional 69,000 units. The Georgia Ports Authority also saw strong growth in roll-on/roll-off traffic, moving 77,574 units through Brunswick and Savannah, a 14.1 percent gain. "Across the logistics industry, focus has centered on GPA's ability to handle large volume increases with no congestion," Executive Director Curtis Foltz said. In his report to the GPA Board today, Foltz added that Ocean Terminal, Georgia's multi-purpose facility in Savannah, nearly doubled its breakbulk cargo in April - expanding at a rate of 96.3 percent (81,691 tons) to reach 166,489 tons of breakbulk goods. GPA's total breakbulk tonnage grew by 38.7 percent for April (89,946 tons) to reach 322,603 tons. "Registering double-digit growth in both Savannah and Brunswick illustrates the depth of support our customers have for Georgia Ports," said GPA Board Vice Chairman Jimmy Allgood. "The numbers show it; when businesses want to reach important markets in a reliable, cost-effective way, Georgia delivers superior supply chain efficiency." In order to maintain excellent service levels, the GPA board on Monday approved $141.8 million in capital improvements with passage of its fiscal year 2016 budget. To upgrade existing assets, the board allocated $33.4 million to improve power infrastructure for cranes, paving, increased rail capacity and other terminal improvements at the ports of Savannah and Brunswick. Another $83.4 million will go toward property development and the purchase of new equipment. Of that, $33 million will pay for 30 new rubber-tired gantry cranes. The addition of conductor rails to support Savannah's transition to more efficient electric RTGs will cost $11.5 million and allow 20 more RTGs to run on electricity instead of diesel. The board also dedicated $16.5 million toward the purchase of four new ship-to-shore cranes. The super post-panamax cranes will cost a total of $48.19 million. 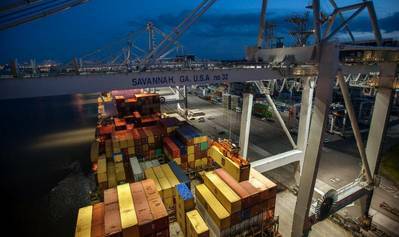 Meanwhile, $3 million will pay for property development needed for expanding business in general cargo at Savannah's Ocean Terminal. At Colonel's Island Terminal in Brunswick, $5.5 million will go to develop more land to support growing auto volumes. "Our long-time policy has been to maintain capacity at least 20 percent above demand through timely infrastructure investments," Allgood said. "By making these commitments now, GPA will be prepared to handle expanding cargo volumes both now and in the future."